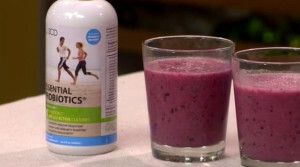 Pump up your morning smoothie with a shot of probiotics! Here are a few good smoothie recipes with probiotics that will support intestinal health†, relieve gas and bloating†, and promote regularity†. We’re all busy in the mornings, but taking the time to give your body a healthy start can make a big difference. Give your smoothie a probiotic twist! Copyright Kansas City Live: 11:30 AM, May 12, 2014.